Sunny. High 69F. Winds NW at 5 to 10 mph..
Perhaps best known for the world’s largest truckstop that sits in its backyard, the city of Walcott wants entrepreneurs to know it, too, is open for business. “We have a community where people live, and that’s all they do. We’ve got to be better than that,” said Mayor Jim Couper, who created a grassroots organization known as Walcott First last fall to tackle community development. Walcott First, which is in the infancy stage, is largely an effort to bring new business to town and improve the community’s quality of life. Couper sees the group’s goal as attracting new business to provide some of the basic goods and services residents can no longer find in Walcott. Located about 15 miles west of the Quad-Cities, Walcott lost its only grocery store a decade ago when the historic Walcott Store — one of the last general stores in Scott County — closed its doors. A startup restaurant closed a couple years ago after a short-lived run. 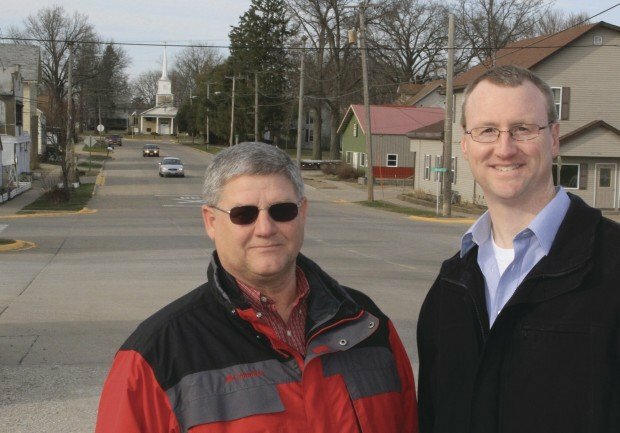 The first-term mayor appointed lifelong Walcott resident Jason Holdorf, an associate with the Quad-City engineering firm of Missman Stanley & Associates, as the group’s director. Brent Arp, who owns Arp Insurance Inc. in Walcott, is the assistant director. “I think we want to keep the energy moving in town,’’ said Holdorf, who admits he considered a move to a big city early in his career. But Walcott’s small-town charm helped convince him and his wife that this was the place to raise a family. Still, he, too, would like to see it grow. “There are some niche businesses that could survive in this town,” he said one recent afternoon as he walked through the sparse downtown. While there are only a few empty storefronts, he said Walcott First might end up being the catalyst for some new commercial construction. The lack of a full grocery store is the town’s “biggest nemesis,” said Arp, who moved to Walcott when he was a child. In fact, Walcott’s location is both a benefit and curse, Couper said. “The problem is we’re too close to everybody — Davenport, Blue Grass, Durant.” The result is that big businesses pass it over. Arp wants to see his hometown enjoy the same success enjoyed by other bedrooms communities, such as Eldridge or DeWitt. Couper believes Walcott First’s role is as much about economic development is it is about filling other needs in the community, such as making improvements around town, beautifying Main Street and providing for the town’s youth. Building a skate park is on the group’s list of ideas. Couper knows most Quad-Citians and passersby think of Walcott as the Iowa 80 Truckstop. “That’s an important part of our community. But people live in town and they don’t always want to go up to the truck stop when they need something,” he said. As a longtime resident, he remembers a day when Walcott had a grocery, a café, several taverns and other establishments. His own wish list would include bringing in a doctor or medical clinic, a small pharmacy, a restaurant and of course, a grocery. “If a new business comes, the community will patronize it,” said Arp, who has operated his Walcott insurance business for 28 years. Serving on Walcott First are business leaders, city council members and residents who, Holdorf, said all bring different talents and strengths to the table. Holdorf said the group is wrestling now with what its strategy will be as well as how to organize from a legal standpoint. Without a city economic development staff, this group might want to become a development corporation, he said. “Do we want to utilize the Main Street corridor as it is? Do we extend it south to the interstate? Those are all ideas being discussed,” he said. But the group does plan to continue some of the Main Street beautification efforts that began with a previous city group, the Walcott Vision Committee. 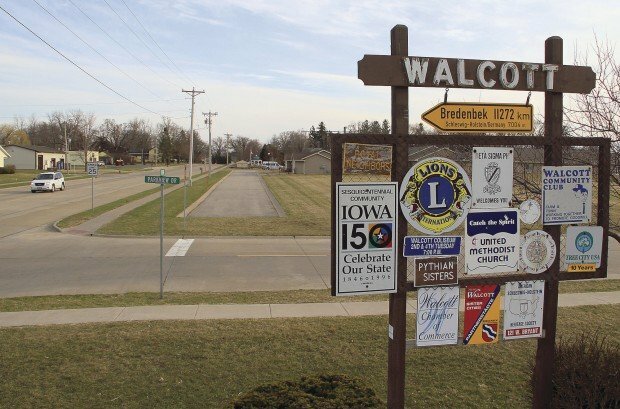 The committee was responsible for some of the new directional signage leading people into Walcott and recent beautification projects such as a new Welcome Park and a gazebo. The committee’s main purpose was to secure funding for a $1.2 million recreational trail project that spans seven acres on the north side of Walcott. The trail, which is nearly completed, connects a mobile home park to the main part of town.